High blood pressure affects everyone, but age, gender, race, or ethnicity may cause some people to be more at risk for the disease than others. This one page factsheet, developed by Measure Up/Pressure Down® with support from United Health Foundation, is designed to educate and empower Hispanics with or at risk of the disease. Download and share with families and friends to teach why certain races and ethnicities are more likely to have high blood pressure and what they can do to lower their risk and manage the disease. Medical groups, health systems, partners, and supporting organizations are encouraged to disseminate the resource to their patients and other stakeholders. 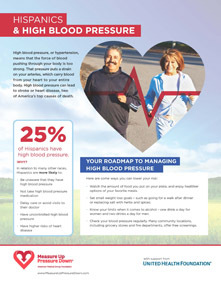 Click here to download a printable version of the Hispanics & High Blood Pressure factsheet [PDF]. Click here to download this factsheet in Spanish.